The Centre for Evidence in Transplantation has a strong track record of producing quality, high impact systematic reviews and meta-analyses. 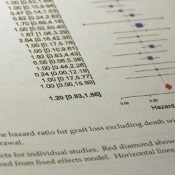 Specific skills include standard and network meta-analysis, mixed effects analysis, survival analysis and missing data. For more information about our current and previous projects, please see the list below. ESOT members can receive free support with conducting systematic reviews. The CET will advise on how to design a search strategy, the databases to search and how to download and sift the retrieved references. ESOT members can also submit a manuscript describing a systematic review to ensure that the manuscript addresses all the items of the PRISMA statement, a requirement of many leading journals. If you have an idea for a systematic review in the field of transplantation and would like the support of the CET, please contact us.